The American Empress Steamboat makes marvellous trips on the Columbia and Snake Rivers in the western United States. When most Canadians think of the American Queen Steamboat Company, no doubt they conjure up images of the wide Mississippi, oak trees dripping with Spanish moss and folks sipping mint juleps on the wide porch of a graceful plantation. That’s a pretty good thing. 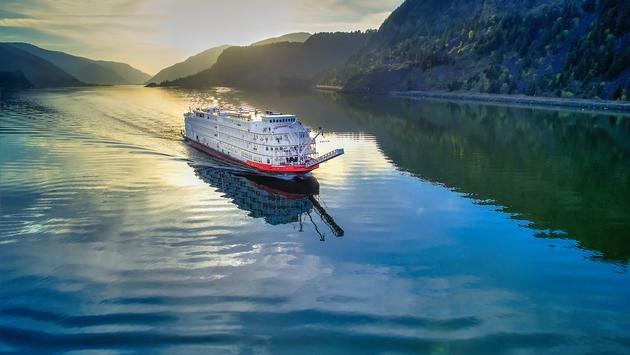 But the American Queen also offers wonderful trips along the Snake and Columbia Rivers in the western United States, with wide open skies, sweet-smelling pines and breathtaking mountain scenery. They’re terrific cruises for any Canadian, but they’re especially easy for folks in Western Canada, who can reach the Pacific Northwest via short drives. Trips along the Columbia and Snake Rivers begin in Vancouver, Washington, just across the river from Portland, Oregon and a short drive south of Seattle. WestJet this week announced it will begin flying from Calgary to Portland on a daily basis beginning April 29, 2019. Guests can experience the same sense of excitement and wonder as fabled American explorers Lewis and Clark as their journey begins near the Pacific Ocean, the objective of the Lewis and Clark expedition in 1805. Passengers visit many historic, scenic and enjoyable sites along the Columbia and Snake River voyage to Clarkston, Washington. Folks looking for something tailored more to a specific interest, you might enjoy the Premium Shore Excursion to beautiful, 186-meter-high Multnomah Falls in the Columbia River Gorge, or a trip to the Western Antique Aeroplane & Automobile Museum in Hood River, Oregon. Deeper than the Grand Canyon, Idaho’s Hell’s Canyon is a dramatic crack in the earth with raging waters best explored on an exciting jet boat ride. You’ll also be in the heart of some of the best wine-growing areas in the United States. Explore the Red Mountain region and sample superb wines among breathtaking scenery. Shore excursions are included in every port of call. The ship also features wonderful, regionally-inspired dining; just the thing after a day enjoying the fresh air and nature of the American west. Beer and wine at dinner are complimentary, and there’s free cappuccino, espresso, bottled water and soft drinks throughout your voyage. On top of that, the ships feature Broadway-calibre entertainment and enrichment programs, including daily chats from an onboard historian. A deluxe hotel stay before your voyage is part of the package, including breakfast, taxes, porterage and transfers to the American Empress. Of course, you’re not skipping along the river in a basic boat but enjoying the history and atmosphere of an authentic paddlewheel riverboat, which harkens back to the days of Mark Twain and a simpler, gentler era. The American Empress is the largest overnight riverboat west of the Mississippi. American Queen Steamboat Company has a terrific promo, with savings of $150 USD per person air credit on American Empress voyages (all categories except CS), with the following dates available: 4/28, 5/12, 5/26, 6/9, 6/23, 7/7, 8/4, 8/18, 9/1, 9/29, 10/13, 10/27, 11/10, 11/17. Offers expire March 31, 2019, or when no valid cabins remain. Air credit will be shown as an additional discount on the cruise invoice. Airfare is not available for purchase through AQSC. Valid on new, paid-in-full bookings made between January 2 and March 31, 2019. Singles booked in double-occupancy cabins will receive double the discount. Not valid on group bookings or existing reservations. Cannot be combined with other promotions or discounts. Promotional fares and amenities are capacity-controlled, may vary by sailing and may be withdrawn without notice. Cruise fares quoted are in U.S. dollars, are per person and do not include government taxes and fees, port charges, gratuities, insurance, personal expenditures or transportation costs incurred while traveling to and from embarkation ports. Not responsible for errors or omissions. Additional terms and conditions may apply. Call for details, and mention Offer Code 2019 SAVINGS.